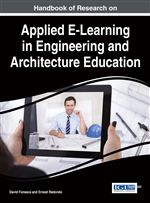 This chapter focuses on the development and adoption of new Multimedia, Computer Aided Design, and other ICT technologies for both Architecture and Computer Science curricula and highlights the multidisciplinary work that can be accomplished when these two areas work together. The authors describe in detail the addressed educational skills and the related developed research and highlight the contributions towards the improvements of teaching and learning in those areas. This chapter discusses the role of digital technologies, such as Virtual Reality, Augmented Reality, Multimedia, 3D Modelling software systems, Design Processes and its evaluation tools, such as Shape Grammar and Space Syntax, within the Architecture curricula. New education methods and studio experiences are enabled by the advances in Computer Aided Design (CAD), Visualization and Multimedia technologies. The introduction of digital skills in the architecture graduation curricula is mandatory nowadays, due to the possibility that computing technologies bring to the resolution of several learning tasks (Duarte, 2007, Celani, 2012). Therefore being or not being digital is not anymore an option (Kruger, 2012). The knowledge about digital processes in design allows students (future architects) to experience the advantage these tools bring to the design problem, and to choose to what extend they want to use them. Computers, CAD systems and Information and Communication Technologies (ICT) have changed the architecture teaching schedule through the last four decades, shifting from a role of computers used as simple drafting machines, to the current role of being important pillars of the architecture curricula (Mark, Gross, & Goldschmidt, 2008). Initially ICT/CAD was seen as a separated technological subject in the architecture curricula. Nowadays those technologies have successfully liaised with design subjects, showing the true potential they bring to other curricula topics (Asanowicz, 1998). Recent research, development and commercialization of new products in multimedia, virtual reality, cloud-aware collaborative tools, 3D modelling and computer animation, among others ICT technologies, has played an important role in the introduction of computers in architecture curricula. This is becoming increasingly possible as technology enable better human-computer interaction and its use is getting more natural, obvious and straightforward, allowing designers not to get distracted from their goal which is design (Lawson, 2006). One of the reasons by which CAD tools, at some point in time, have been rejected in design studio classes, was the controversial relations of designers with computers, due to the fact that designers believed computers could not answer design issues the same way a human designer could (Lawson, 2006). Nowadays computers increasingly perform more and better and may help designers to find and gather knowledge and perform tasks they would not be able to do, without computers and ubiquitous communication infrastructure. One of those tasks made viable by ICT, is the possibility of evaluating the quality of architectural spaces, prior to the construction phase, through the simulation of the designed space in virtual environments (immersive or semi-immersive), which has earned interest in the academia, from both the scientific and teaching perspectives. At the same time, digital tools have been used to predict peoples’ behavior within built environments, to identify design problems and also its potentials (Hillier & Hanson, 1984; Hillier, 1984; Penn et al, 1997; Drettakis, Roussou, Reche, & Tsingos, 2007). In this chapter we present the strategies for using Digital technologies in Architecture and Computer Sciences curricula in our school at ISCTE-IUL, regarding both the available facilities and equipment, the pedagogical methods used and results achieved so far. We end with some discussion on the advantages of adopting such technologies for teaching Architecture and its related studies. Design process: The methodological stages used to develop a design. Stages are connected, can be subdivided and based in specific techniques. Design Evaluation: Set of theories and techniques that enable the evaluation of design solutions according to several variables. Biometrics: Process of measuring and statistically analyzing human body data characteristics. Space Syntax: Theory and a set of techniques that enable to analyze space and its social effect. Generative Design: Design method that creates design solutions through rules or algorithms. Shape Grammar: Generative design system that analyses and generates designs through computations with shapes. Data Collection: Set of techniques that allow gathering and measuring information on certain variables of interest.